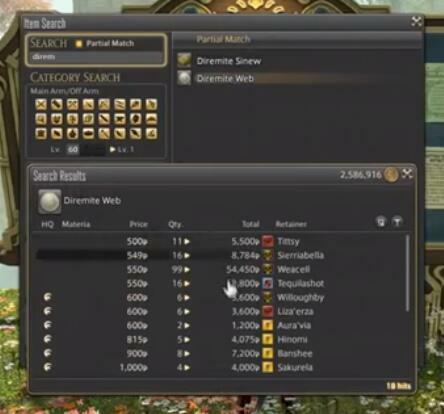 How to earn some FFXIV Gil on the market boards without crafting or gathering skills. 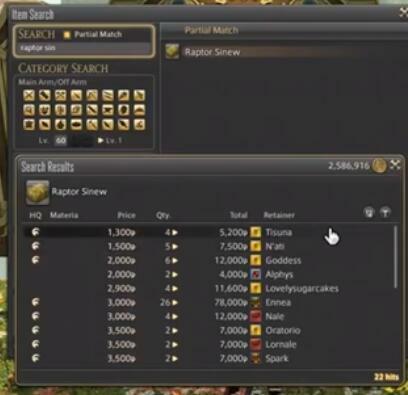 You will be able to find out in the world and kill in order to make some FFXIV Gil on the market board. You can do this starting as low as level 25. The first thing we are gonna be looking at is dire my web. As you can see here on the market board. They are selling for you a nice chunk around 500 each. We do have some raptor seeing you that sells for nearly a thousand per piece on our market board. There is also fleece which is going for a decent price as well. This guide is to quickly guide you where to find theses things and where to kill them for you. This is quite helpful for those who don’t have max crafters and max gathers of that. These item are specifically chosen because they are required for crafters to be able to get to their next level. These things are paramount to be able to have available to a crafter to be able to level up. So these items are in high demand, almost constantly. So these items are not going to be a problem to be able to turn profit on very very quickly. So the first thing that we are going to be doing is to going to get dire my web. We are going to killing bees mites out here at fall court float in North shroud. These guys are level 25 and should not be a problem for you at level 25. Or even you get there at level 23, however, the higher you are, whiling killing these things faster the process will be. The next is going to be in Center Shroud event Benbranch met Roes. You are going to be killing these Raptors around here. These Raptors probably about the best cluster I can find for Raptors and around this area. You are able to get a solid pass through and then have to wait about 20 to 30 seconds at least. I am with my current gear before before they spawn gain. So nice bonding out here as well. They started at about level 31, so you should have no problems coming out here at around that level or higher to be able to clear these guys out and get some raptor seen you as well. The next place will be going is Northeast Central Highlands. Out here you are going to be looking for the Ornery Karakul. These Ornery Karakuls have fleece. This fleece is very important for leveling up Weaver. And it’s another way to be able to get out here and make some FFXIV Gil. Now this does not drop nearly as often as the rapture sinews or the dire my web. You do have to be a little bit more patient. However, the demand for these things are pretty high. So find these things in your servers. I have been on about 45 server so far in FFXIV. No mater what serve them on, no matter when it is, these items are always in demand. They always sell well. You can always do things like selling or selling other things like this. But those require gathering and the whole purpose of this video is to show you how to earn some FFXIV Gils in the market. How to make it quick and how to make it easy.